How to Unblur a Picture? Restore the sharpness of your photos in a couple of clicks! In modern photography blur can be a stylish artistic effect but more often than not the lack of sharpness in a picture is caused by an operator error or subject movement that couldn’t be controlled. While it's better to properly focus your camera before taking a shot, this isn't always possible due to changing photo conditions. If you’ve ended up with smudged pictures, it doesn’t mean you should throw them away or pay a professional to work magic on them - you can do everything yourself! So, how to unblur an image and make it clear again? Luckily, you won’t need any expensive equipment or advanced skills if there’s PhotoWorks by your side. 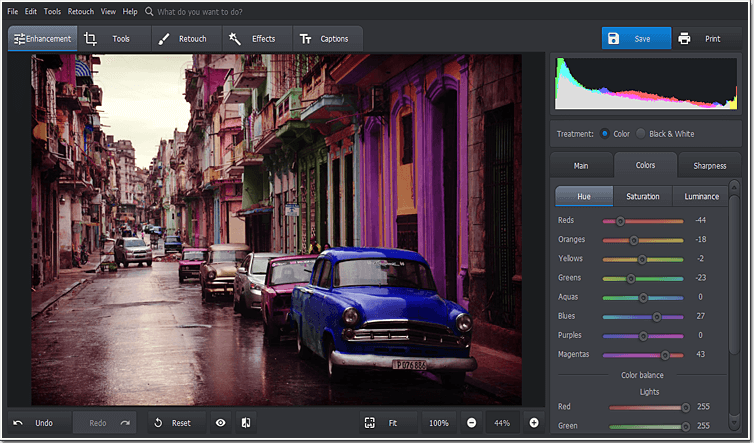 This image editing software can take care of your blurry shots and restore their quality in a few clicks. Sounds too good to be true? Let’s get things under way and get this program a chance to increase the sharpness of your photos. Run the program on your computer and add your photo there. While on the Enhancement tab, click Sharpness on the sidebar to open a new menu. Before applying the Sharpen tool to your photo, set the preview box on some particular area to better see all the changes. Click the icon on the right and place the targeting square over a blurry spot. Now, move the Amount slider to the right to increase the photo sharpness. You’ll instantly see an improvement but don’t drag it too far to the right to avoid digital noise. The Radius setting manages the width of the sharpening effect. Choosing the right radius is critical to good unblurring. 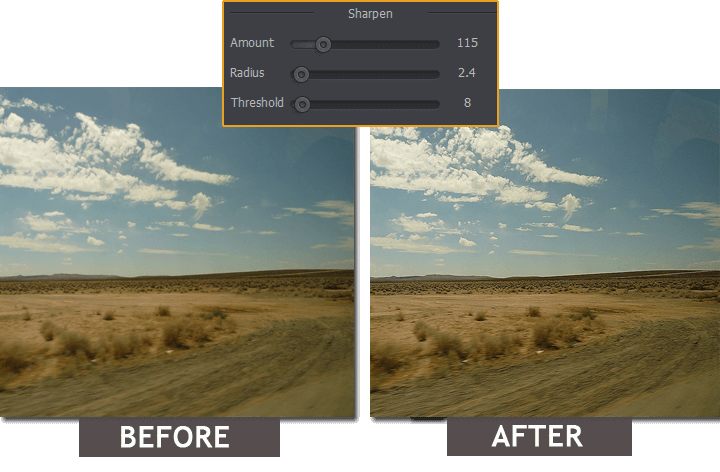 By adjusting the Threshold slider, you’re determining how different two pixels need to be to apply sharpening. In practical terms, your Threshold adjustments should range from 3 to 10. After you’ve sharpened your photo, click the Before/After button to compare the initial image and the resulting one. If you’re satisfied, save your unblurry picture as JPEG, PNG or TIFF. Another great feature of PhotoWorks is that it can apply certain effects and adjustments not to the whole picture but only to some of its parts. For example, you can sharpen blurry images but leave their edges or background blurry for a more stylish look. Want to do pro-level editing and apply other changes without Photoshop? 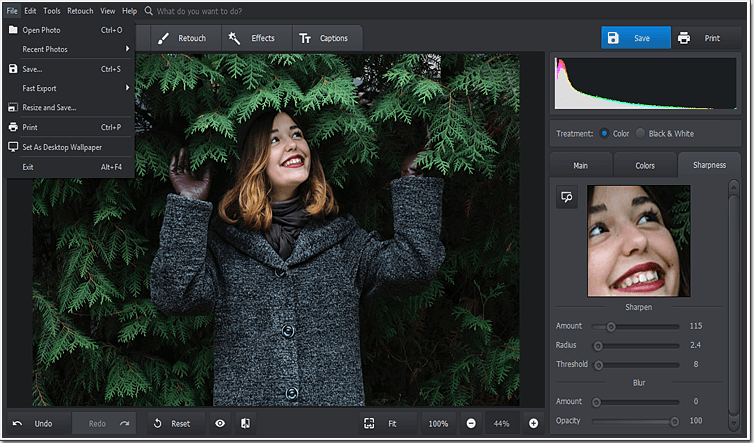 Check out more great options of this powerful image editor! Want to give your latest photos a retro look? 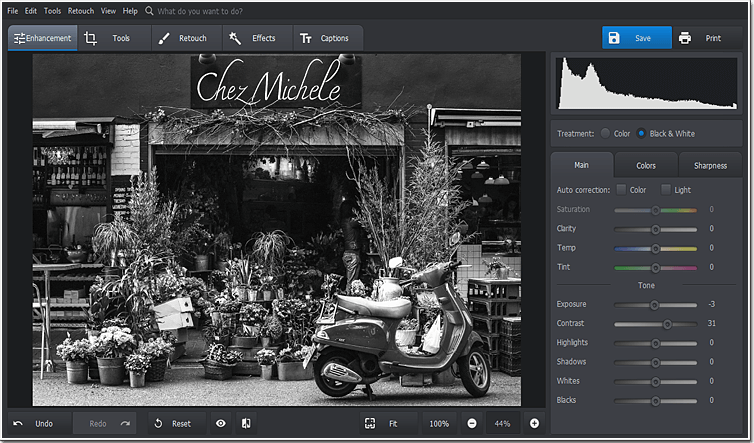 The easiest way to achieve this old-fashioned effect is to make pictures black and white. The program will offer you plenty of instant filters that can desaturate your image in a single click. If you want to have more control over the effect you apply, adjust manual settings to gradually relieve your photo of bright hues and tinges. Sometimes a busy background ruins the mood of your photo or simply spoils it with unwanted elements. PhotoWorks is here to replace it with a more appropriate image. Send your photo-self to a tropical beach or to a calm garden with no problems at all. The tool is highly efficient and easy to use - no more tedious selection of your main subject and a would-be-changed background. If you couldn’t adjust camera settings at the shooting location and got unnatural or dull hues, you can still color correct pictures in post-production. 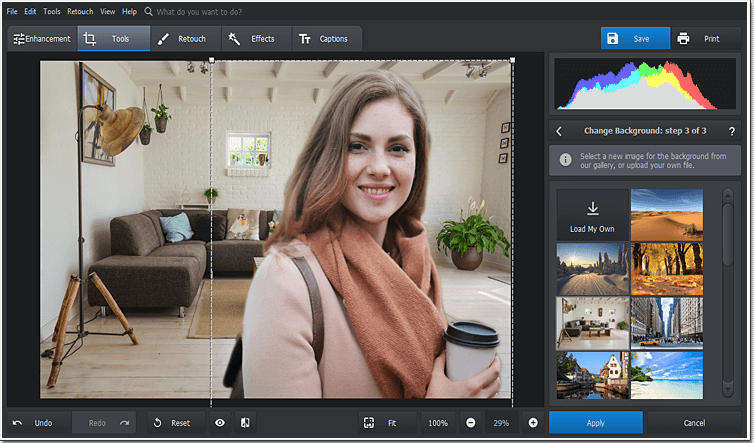 The software is capable of auto color enhancement - just one click and your picture will be bright and vivid again! An array of other built-in tools will help you control the overall contrast, accentuate one particular color and even apply tone mapping. Shooting in low-light conditions can result in digital noise that fills your night photograph with small nasty dots. 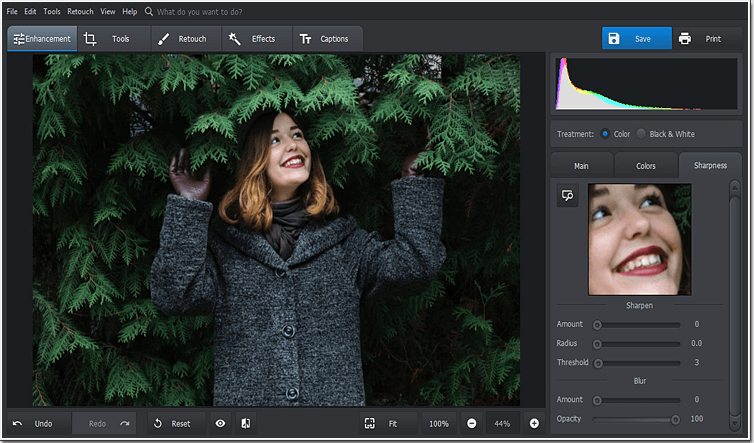 With PhotoWorks software, fixing grainy photos has never been easier! 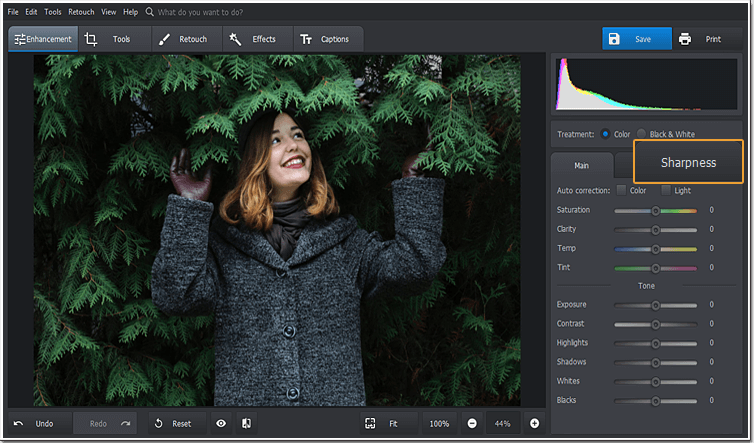 Unlike other image editors, this multifunctional program doesn’t require any special skills and lets you denoise any picture with a single movement of the slider. 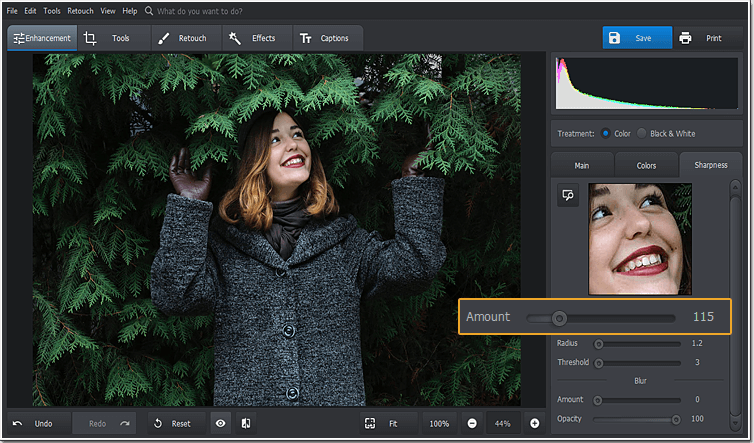 PhotoWorks is an all-in-one program for saving all kinds of ruined shots. You can restore its quality in a flash, brighten a dark picture, remove unwanted elements and retouch a portrait like a real pro. 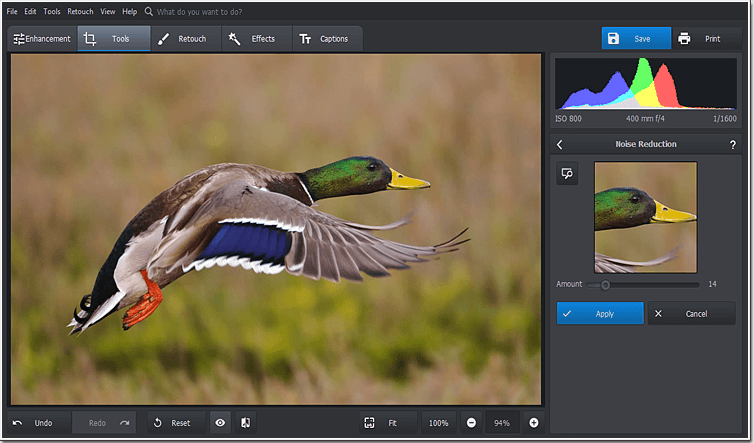 Get started with this image editor today and give a polished look to all pictures in your collection!